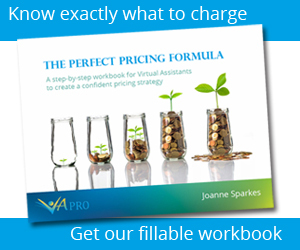 As a virtual assistant, part of our job is understanding technology, knowing our way around a computer and being familiar with how small business software works. To this end, it’s not uncommon for my customers to call me up with a technical “how do I…” question or a “I’m trying to do this, but…” – sound familiar?? When you’re not there to stand over their shoulder and talk them through the the “How To” I often find it far easier to send them a screen shot of what I am looking at than trying to describe it over the phone. This article is inspired by the fact that I was recently surprised to find that there are many people out there who don’t know about the basic functions that are available, for free, and built in to modern office computers, and it turns out that many of you haven’t thought of, or don’t know how to send a screenshot. So especially for you, here’s three easy ways to send professional looking screen prints to your customer in just a few seconds without the need for any fancy software. Arguably the easiest way of doing it on a windows PC – and it’s surprising how many people don’t know this function even exists! All you need to do is bring up on the screen the page that you want to capture then press Print Screen (sometimes shortened to PrtSc on a laptop). This key is usually found somewhere on the right hand side or top right hand side of a UK or US keyboard layout. Now in some cases, you may want to edit this screenshot slightly, perhaps to highlight certain areas or maybe to crop out excess information that you don’t want the end user to see. The easiest way to do this is open the image in paint. On a windows computer, go to Start > Programs > Accessories > Paint and open the program. If required, make any edits that you need to, I find that often it’s easier to zoom out slightly so that you can see the image on one screen before cropping or editing the screenshot. 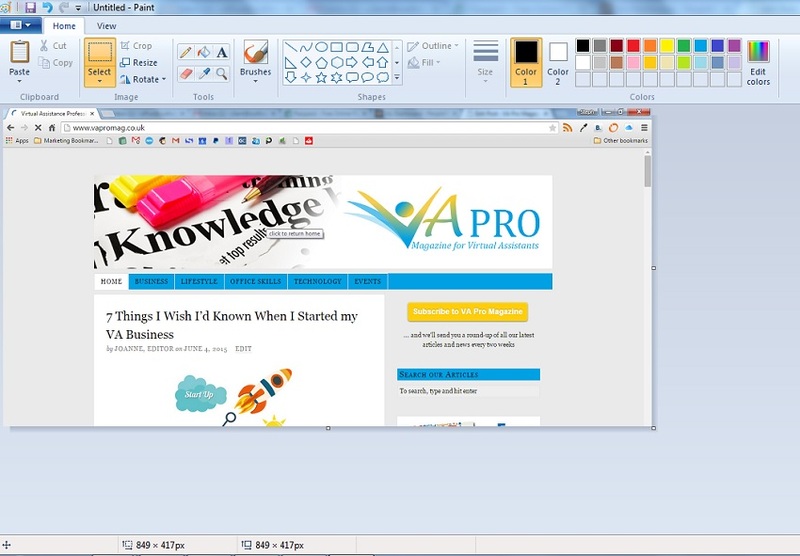 You can then use your screenshot just like any regular image to attach to an email, add to a web page etc. 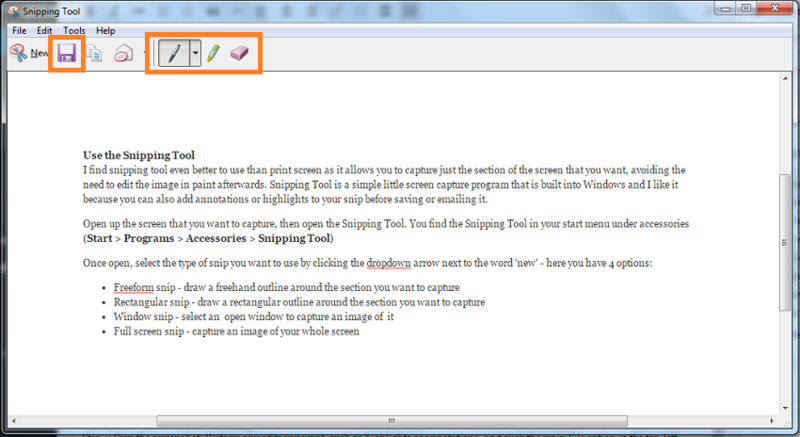 I find snipping tool even better to use than print screen as it allows you to capture just the section of the screen that you want, avoiding the need to edit the image in paint afterwards. 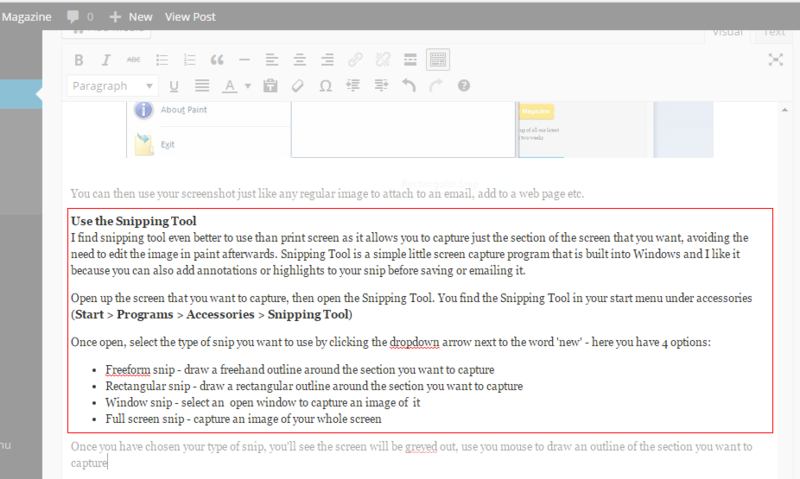 Snipping Tool is a simple little screen capture program that is built into Windows and I like it because you can also add annotations or highlights to your snip before saving or emailing it. 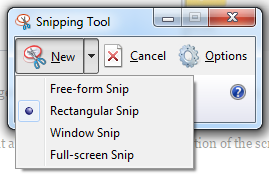 Once you have chosen your type of snip, you’ll see the screen will be greyed out, use your mouse to draw an outline of the section you want to capture. Note: as soon as you let go of your mouse, your snip will be ‘captured’, so you might need to practise a few times the first time you use it! When you let go of the mouse, you’ll be taken back to the snipping tool, where you can use built in functions to annotate or highlight you image. 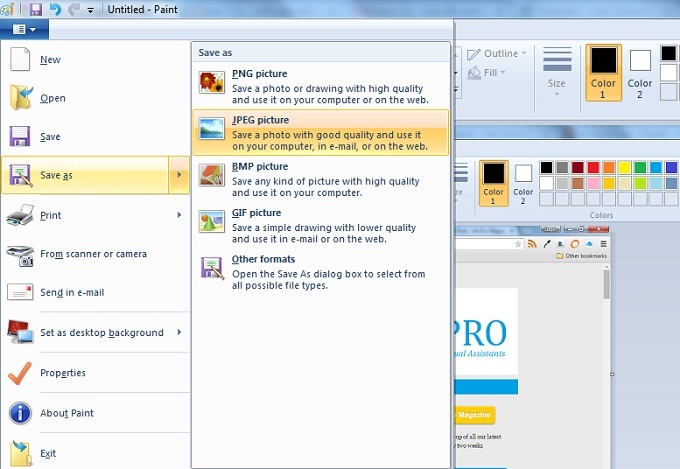 There’s also an option to copy the image to your clipboard, or share directly via email from the snipping tool. When you are happy with your edits, click the save icon to open up a save window, give the image a file name and select the image type from the dropdown box (as before, JPEG and PNG are the most common image file types for sharing on the web or via email) then click ‘Save’. You’ll see a crosshair appear, use your mouse to select the area you want to capture by clicking and dragging across the area. As soon as you release the mouse, your screenshot will be saved as a .png image file on your desktop – how easy is that?! If you want to capture an image of your entire screen (i.e. in the same way that Print Screen works on a windows computer) then use the keyboard shortcut Cmd-Shift-3. This will immediately take a snap of your whole screen, and you will find the file saved on your desktop as a .PNG image file. In the same way as described for the other methods, you can now simply use these image files to attach to an email or add into any document as needed.